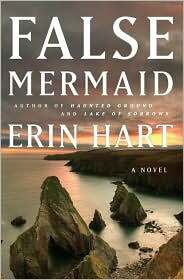 Erin Hart writes a series of archaeological crime novels set in the mysterious boglands of Ireland, the lastest of which is False Mermaid. After graduating with a theater degree from Saint Olaf, she earned an M.A. in English and creative writing from the University of Minnesota-Minneapolis, and worked as an arts administrator, journalist, and theater critic. A lifelong interest in Irish traditional music also led her to co-found Minnesota's Irish Music & Dance Association. Her debut novel, Haunted Ground, introduced readers to pathologist Nora Gavin and archaeologist Cormac Maguire. Lake of Sorrows, the second novel in the series, was recognized as a Minnesota Book Award finalist in 2004. False Mermaid is the third book in the series. Erin will be reading from False Mermaid at 7:30 p.m. on Monday, March 29th at Magers & Quinn, 3038 Hennepin Ave So. Today she’s answering our 6 questions. The People of the Book by Geraldine Brooks. It caught my interest initially because it was about a book restorer, and I'm working on a story involving a ninth-century manuscript. As a fan of complex, layered plots, I especially like the way Brooks alternates between the modern-day narrative of the book restorer, and episodes from the book's earlier history-delicious. I remember being incredibly let down when I finished reading East of Eden, being really engaged by the character of Adam Trask, with the way he thought and spoke. I guess I enjoyed being in his company, and was sad when I finished his story. And I seem to remember that as a teenager I had quite a yen for Sydney Carton, the dissolute but self-sacrificing hero from A Tale of Two Cities. I have lots of favorite authors, so we might need to book a whole room! But if I had to choose one, it would probably be A.S. Byatt (Angels and Insects, Possession, The Children’s Book), and I'd take her to W.A. Frost in Saint Paul, a warm, comfortable place where you can actually carry on a conversation! The first book I really loved was a storybook called The Tall Book of Make-Believe by Jane Werner and Garth Williams; I can remember the stories, and still see the illustrations in my mind's eye. The first chapter book I remember being a favorite was Half Magic by Edward Eager, about four siblings who discover a magic coin that only gives them half of what they wish for-because somehow that premise seemed so much more realistic than a genie that would just grant any three wishes! I'd have to say The Complete Works of William Shakespeare-if it's really the only book I can save, because there's plenty in it. The Sound and the Fury by William Faulkner-I've always meant to read it one day. I actually enjoy the challenge of an unconventional structure!